How Do I Use a Cloth Diaper Cover? After choosing a diaper cover you'll want to know how to use it. Different cloth diapers will require or fit better under different styles of diaper covers. Some cloth cloth diapers do not require a cloth diaper cover at all. All-in-Ones (AIO) and pocket diapers do not require a cloth diaper cover as they have one already included. 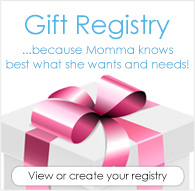 All other cloth diapers, including flats, prefolds, contours, and fitted diapers do. The diaper cover provides a layer of protection between the cloth diaper and the baby's clothing to help prevent leaks and keep baby comfortable. There are many kinds of diaper covers that require slightly different use. 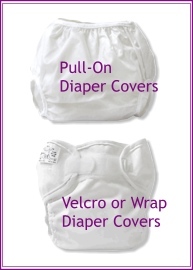 Velcro diaper covers are shaped much like a disposable diaper. After putting on a cloth diaper, lay the baby on the back of the diaper cover, bring the front through the baby's legs and secure. The Velcro diaper covers have two wings that fasten around baby's hips and hold the diaper cover in place. The covers fit snugly and will hold a prefold diaper in place without additional fasteners. When it is time to change diapers, simply remove the cover by releasing the Velcro wings, and you have easy access to the cloth diaper. Pull-on covers are much like underpants. They just pull on over baby's legs and cover the cloth diaper. They are a looser fit, so the cloth diaper underneath must be fastened securely with diaper pins, a Snappi, or have another style of closure such as snaps or Velcro before pulling on the cover. To remove the pull-on covers, you simply pull them back down the baby's legs. Side snap covers fasten with a series of snaps on either side of the diaper cover. They generally do not have wings like diaper wraps, can be used like a pull on covers but can also unsnap for easy, mess-free changes. After putting on a cloth diaper, you lay baby on the back of the diaper cover, bring the front around through the legs, and snap up the sides to keep it in place. Snap covers are a looser fit as well so the diapers require diaper pins, a Snappi or another style of closure to keep the diaper in place. To remove, simply unsnap the sides of the cover for access to the diaper. After choosing a diaper cover and learning how to use it, you may also want to read a few of our other Cloth Diapering How To's for more information.